You have to file a divorce petition with the court and show the reasons why you want the marriage to end. 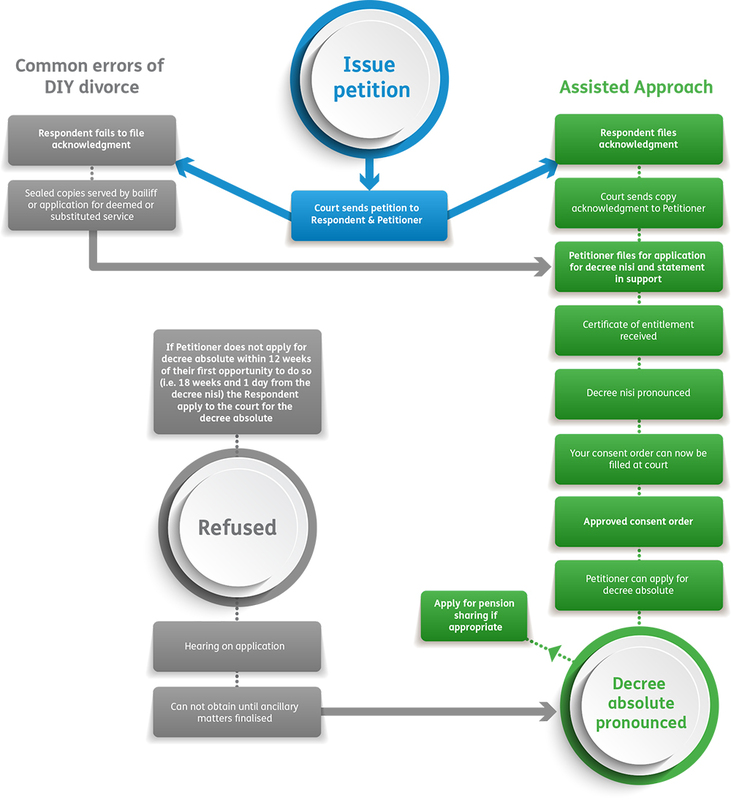 The petition is the document which starts the divorce process. The person who issues the divorce petition is called the petitioner, the other partner is called the respondent. Once you have selected one reason, you will need to give further supporting information to explain why it applies in your case. For example, if you are getting divorced on the basis of unreasonable behaviour, you will need to include examples of your spouse’s behaviour which affected you the most, and the most recent incidents that caused the marriage to break down. Your ex-partner needs to respond to the petition with an Acknowledgement of Service. If your ex-partner refuses to return the Acknowledgement of Service, then the process is NOT halted. You will need to go through an additional process to arrange personal service of the documents. Divorce Negotiator has helped many clients to get their divorce moving, in a situation where their spouse would not sign the paperwork and send it back to the court. What application needs to be made depends on your circumstances. If you are stuck on this issue, give us a call on 0800 177 7702. You’ll be granted a Decree Nisi if your ex-partner doesn’t defend your reasons for a divorce. If they do defend, it then you can still apply for a decree nisi, but you’ll have to go to a court hearing to discuss the case. At this point, there is a 6 week and 1 day period before the Decree Absolute can be applied for. This is a cooling off period, to ensure you definitely want to divorce. It is also a time to arrange the Consent Order. The court will expect to see that the division of assets is fair, and an agreement for the care of any children is in place. The Decree Absolute will legally end your marriage and allow you to remarry. It is not advisable to make arrangements to re-marry before you have the Decree Absolute, as delays at the court or with your ex-partner could extend the process. Ensure you send the original copy of your marriage certificate when you send your divorce petition to the court. Ensure you enter the names exactly as they appear on the marriage certificate. Check the details of the marriage you have entered are correct, e.g. date and place. Check the addresses you entered are current and correct. No payment is received. This used to be a cheque, but now you can send a letter with details of who to phone to take payment. The court will then phone the number provided. Click here for common reasons that paperwork gets rejected.